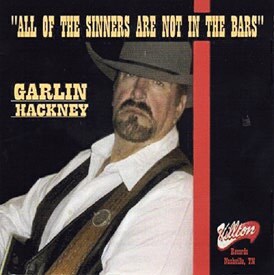 "All of the Sinners Are Not in the Bars"
"All of the Sinners Are Not in the Bars" (on Hilton Records Nashville, TN) the new CD by Garlin Hackney and produced by Steve Ledford. Honky Tonk Outlaw the first release was picked by 36 stations to date with over 15,000 spins and peacked on the charts at #47 source: (New Music Weekly) Players Credits: Steve Ledford-bass, Delaney Jackson-lead guitar, Aaron Till-fiddle and Lee Kelley-drums all from Mark Chestnutt's New South Band also Rusty Danmyer-steel from LeAnn Rimes band and Mark Burch-keyboard from Billy Currington's band. Release date was October 27, 2006. Born: Inez, Kentucky, 23 miles from Butcher Hollow. Graduated High School 1966 and started playing the honky tonks. 1970 to 1977, The Garlin Hackney Show, booked by the John Moore Agency, Columbus, Ohio. 1972, signed with Sandcastle Records, New York City and released "9,999,999 Tears" produced by Razzy Bailey also recorded at Studio One, Doraville, GA with producer Steve Clark. 1979 recorded album at Gusto Starday studio with producer Tommy Hill. 1980 recorded "You've Been on My Mind All the Way" for Door Knob Records, Gene Kennedy producer. 1985 released "Slowmotion" album produced by Tommy Hill, also released single "Leavin's on Your Mind" on the Hilton label in Nashville, TN. Rockabilly CD: "Everything's Cool" produced by Tommy Hill on the Rockabilly Hall of Fame labels. Country CD: "Branded Country" produced by Don Bradley on Keep It Country record label. 1977-1991 at R.L. Leggett's Nashville Sound and Walt Page's West Texas Music Club in Atlanta, GA as a house band. Garlin opened for Vern Gosdin, Billy Joe Royal, Joe Stampley, Johnny Paycheck, David Alan Coe, Razzy Bailey, Pretty Miss Norma Jean, J.D. Sumner and the Stamps, Doug Stine, Kathy Hill and Stephanie Bently were in his group.